For some time I was focused on just getting the gym going, getting coaches hired and onboarded, figuring out membership policies, programming, etc. but at around the one year mark, much of that had settled into some semblance of routine. It was time to start tackling the backyard! I know my members pretty well and always take note of what they are interested in, what they do for work, etc. As I began considering the first steps of the project, I quickly realized I knew nothing about landscaping, construction, design, etc. Lucky for me, CrossFit gyms tend to attract smart, hardworking, and interesting folks from diverse professional backgrounds, so I began kicking people’s tires about helping out with the backyard. Quite quickly, I had enlisted the owner of the building (a longtime member and friend, who works in real estate), a maintenance engineer, another member who works in real estate and construction, and our forewoman, who works for a big landscape design company. Their expertise plus some muscle from our members (with me doing what I do best- running around getting coffee and cutting checks) and we had a solid team in place. The general idea for the space was to build a matted fitness space that ran off of our big double garage doors. The space would have a rig on it (see Part 2 for how we chose, bought, and built the rig) but we wanted to make it semi-permanent (aka not concrete based) so that we didn’t run into permitting issues. We’re planning to use “road base”- a highly compacted rock/gravel/sand mix that will be poured into a mold and tamped down to create a hard but permeable surface. The mats will go on top of that. While I was initially skeptical, road base is what goes under our roads and highways (good name, huh? ), so if it can hold a car it can probably hold a few people and barbells. Over the entire fitness space we wanted to install a tarp to keep the area from getting wet and to keep the hot Texas sun from melting our members when they worked out there. The rest of the space would be covered in mulch and/or decomposed granite so that rainwater wouldn’t pool, we wouldn’t track mud and dirt everywhere, and everything would look clean and tidy. With the added expertise, it quickly became clear that my original ideas about what was needed were pretty off base. The backyard needed a bunch of work to just get to the point where I thought we could start building! So before starting any of the “fun stuff”, we had to clear everything out of the space (it had inherited a bunch of detritus from the build out), used a sod cutter to shave off the top layer of patchy grass and poured a concrete extension of the gym floor that would take us past the roofline and keep us from running into rain issues. At that point, we realized that we needed to build a retaining wall as our neighbors property had a tendency to drain into ours and we didn’t want our surfaces to get (literally) undermined by runoff. The retaining wall took a good bit of work and a lot of concrete blocks, but definitely helped the space look more finished and will prevent future problems from popping up. Finally, for now, we poured thick concrete “feet” that will support the metal beams the tarp will be anchored to. The whole area is probably going to be a little overbuilt, but I’m hoping that will mean less problems down the line… stay tuned! Obviously, there’s still a LOT to do on the project! We are currently getting the beams welded and those will be bolted into our concrete feet. With that up we can install the tarp and ensure that the remaining steps don’t get (literally) washed away. 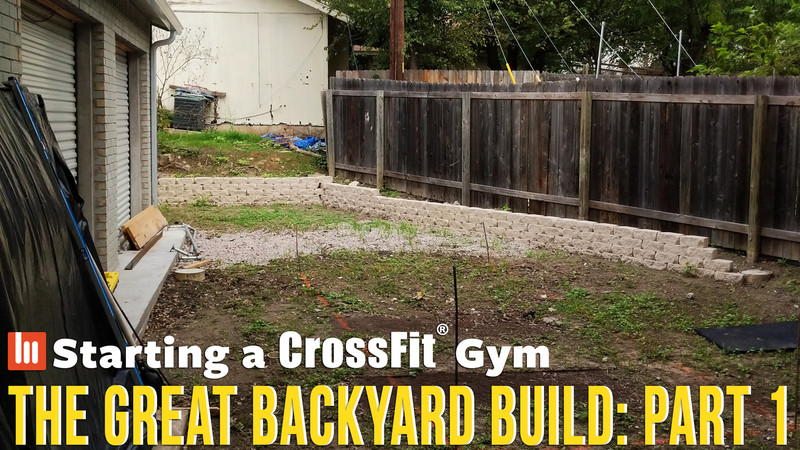 After that, we build a concrete base for the rig, install the road base “floor”, install the mats and the rig, finish out the rest of the backyard (mostly mulching) and then… fitness?